Keeping ducks or geese is usually problem free although there is one problem commonly called ‘wet feather’ that can strike one or more of your birds. Waterfowl feathers are usually waterproof, this is to protect the bird against getting waterlogged whilst swimming. Macro photo showing the small ‘hooks’ on them called barbicelli that interlock. Ducks and Geese preen their feathers after bathing and cleaning themselves. There is a gland on the rump of the bird called the preen gland that produces the oil that waterproofs the feathers and during preening, this oil is combed over the feathers, waterproofing them. 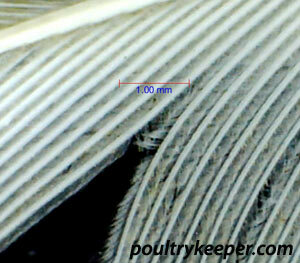 Feathers have very small ‘hooks’ on them called barbicelli (see photo right taken with a microscope) that are interlocked by preening, giving the bird a protective layer to help repel water, we’ve all heard of the saying ‘like water off a ducks back’ and normally water is repelled and does just ‘roll off’. Ducklings or goslings hatched naturally can swim in water at a day old. They are waterproofed by the mother from contact with her feathers. Waterfowl hatched in an incubator or by a broody hen that do not have a ‘mother’ duck or goose to give them this waterproofing should be kept warm after a swim to dry off or they can catch a chill and die during their early days. Many people assume ducklings can swim from day-old and will be waterproof but without the mother giving them their waterproofing they soon get soaking wet. It appears that there are a number of possible theories about the causes of wet feather and a number of different solutions to curing it, depending on who you talk to and which books you read! 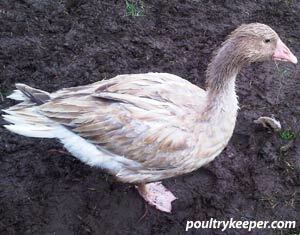 Some waterfowl breeders I have spoken to said there is no cure and birds with this condition should be culled. Wet feather is when the feathers of the bird stay damp or wet, rather than having the usual glossy sheen. Feathers are basically water logged and have lost their waterproofing so absorb rather than repel water. Usually, it is the outer feathers and sometimes the flight feathers and the down that are affected. Birds become cold and will usually avoid the water, making the problems worse. When feathers get muddy, wet feather can strike. It is thought that the mud strips the feathers of their oily protection and it becomes difficult for birds to re-oil them again. To prevent this occurring, try to keep birds away from muddy conditions. Sometimes new feather growth the next year will cure the problem but not always. Ecto-parasites (those living in the feathers and on the skin) can cause over preening which in turn is thought to cause wet feather by the bird breaking down the interlocking barbicelli. Birds should be treated for the parasites. When birds are kept without sufficient water and then moved to a place with plenty of water, they can get wet feather. It appears that most birds will regain condition after a couple of weeks providing they are healthy. Another cause of wet feather is when the preen gland is not producing sufficient oil. This can be caused by a poor diet. Wheat is recommended for most waterfowl as it provides essential vitamins B and E as well as the more standard maintenance pellets for waterfowl. Remember provide clean water for bathing at all times and as much free range as possible so that birds can supplement their diet and hopefully you won’t have any problems with wet feather.